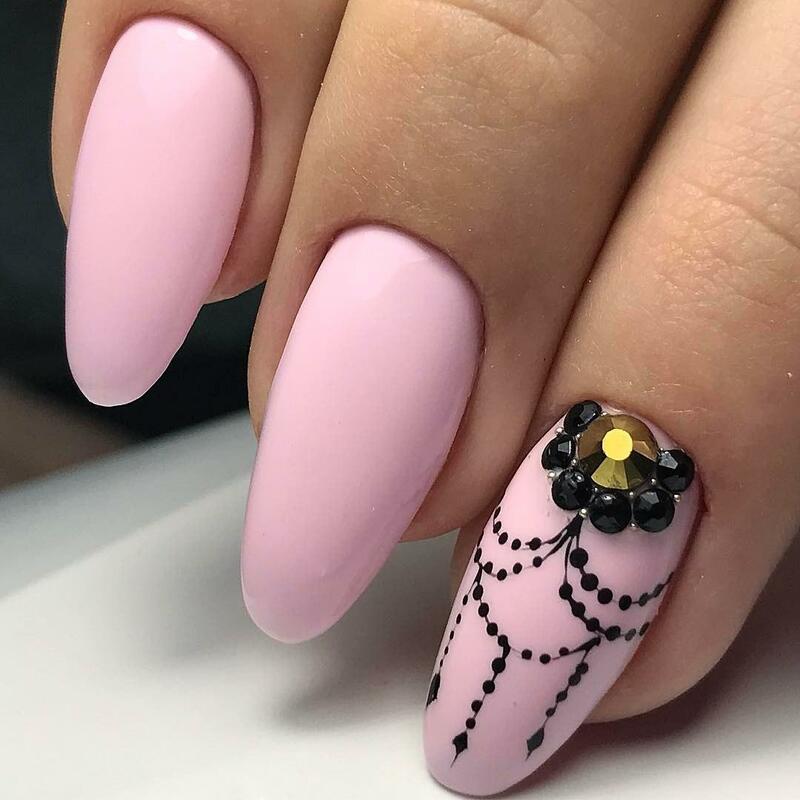 Nail designs with rhinestones always look elegant and festive and that is why this type of nail art is more suitable for a special occasions rather than as an everyday manicure. 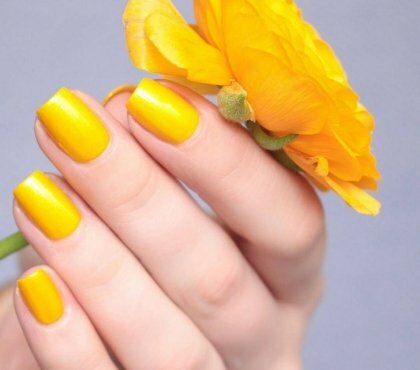 However, crossing the line of good taste is very easy and when you think of adding crystals to your manicure you should always remember the motto of minimalism “Less is more” which, in this case, is more valid than for any other nail design. 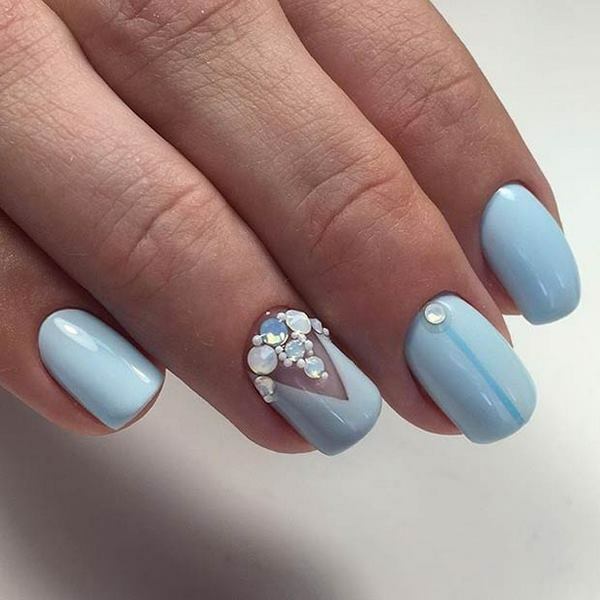 It is sometimes difficult to resist the temptation to add more and more glittering stones but you need to be careful not to overdo the decoration and end up with something that looks like kitsch instead of the elegant image of beautiful nails that you have in your head. 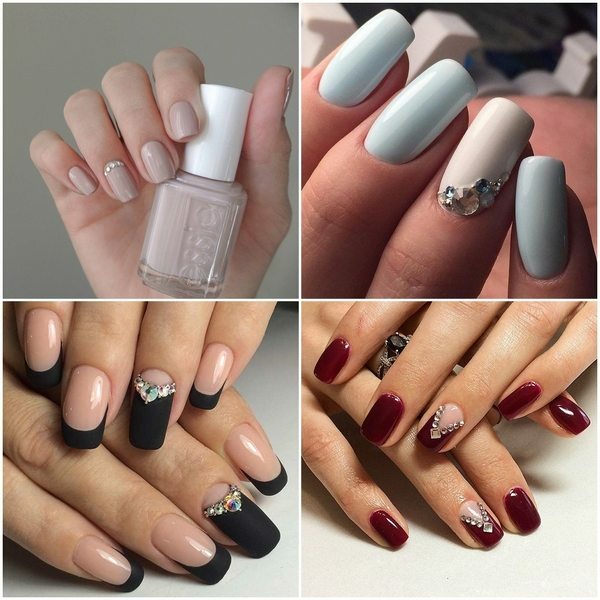 Modern nail design offers a huge variety of shapes and patterns, decorative elements and options. 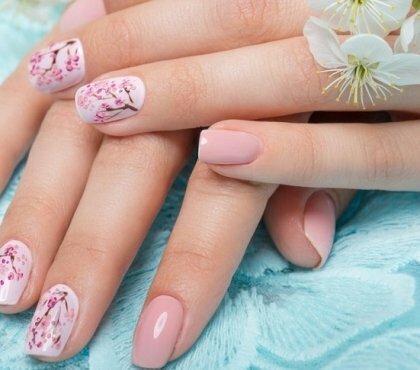 You need certain skills, patience and accuracy to create a beautiful composition on the nail plate. Going to a chic party or a celebration, you will want to look stunning, irresistible and brilliant. 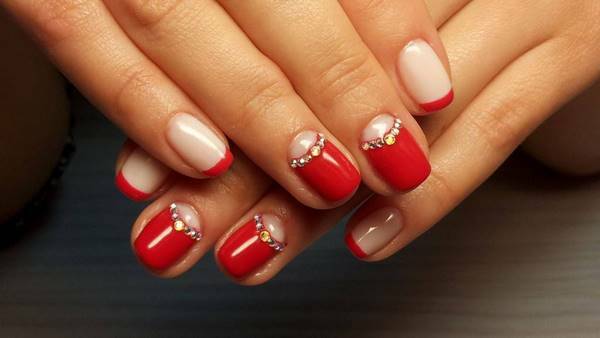 A touch of delightful glittering decoration on the nails will be a complement to your elegant dress and evening make-up. 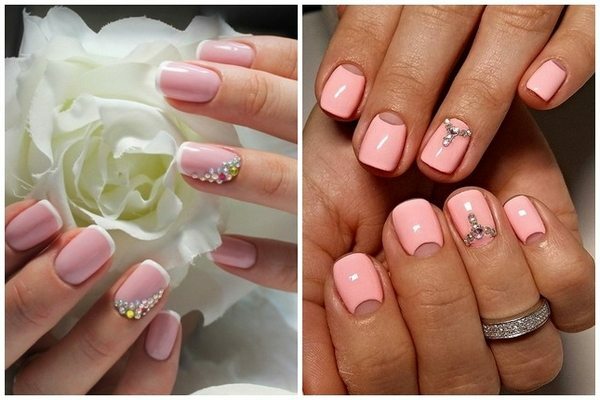 A manicure with rhinestones looks so luxurious that it is quite possible to replace the ring or bracelet on your hand or, if the pattern is chosen correctly, it will perfectly match them. 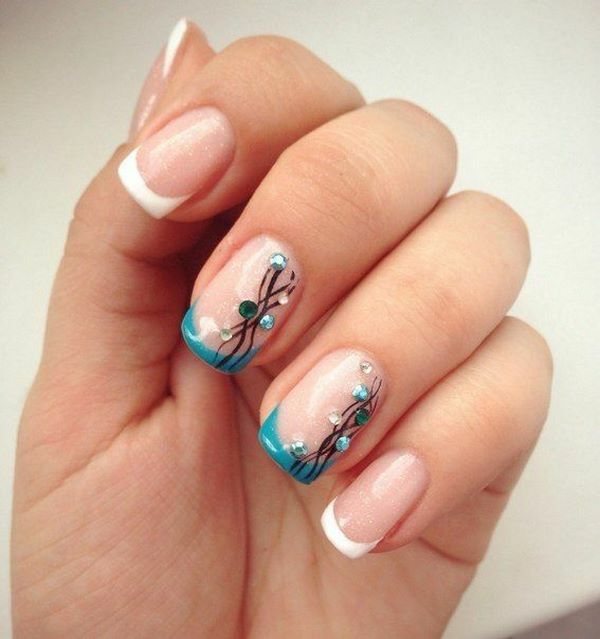 Creative masterpieces on artificial nails look best, because they are stronger, more durable and not so prone to damage. 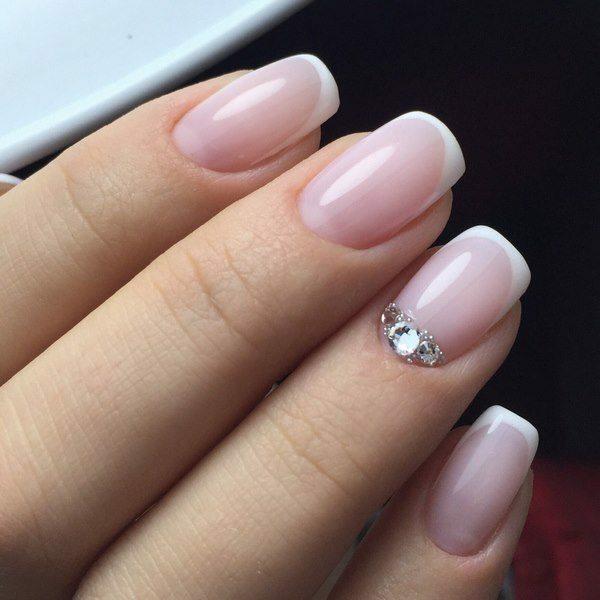 What is important to know for nail designs with rhinestones? Rhinestones are an imitation of precious stones, which, with a multifaceted shape, shine like real ones. The reverse side of the stones is flat which makes gluing them on the nails easy. Rhinestones come in several varieties – crystal, glass, acrylic stones, as well as plastic and zirconium elements. Glass crystals come in two main varieties – machine cut and unprocessed – just stamped in shapes. Stones, in general, come in different shapes, sizes and colors – they can be transparent, colored and with a hologram effect. There are also other effects like satin coating, metallic, with reduced transparency, etc. Even the cheapest plastic rhinestones may look beautiful. 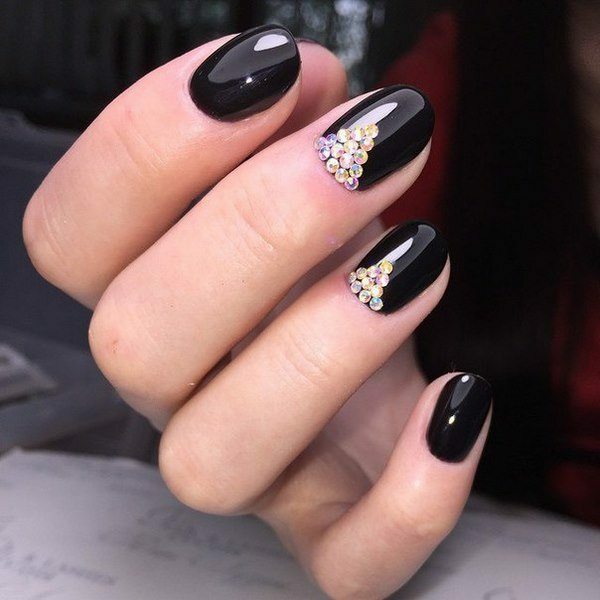 The main advantage of this manicure is the ability to use rhinestones several times, creating all new patterns. When properly used, rhinestones can decorate your nails up to ten times and they will not lose their luster and beauty. Some women prefer the magnificent Swarovski crystals whose radiance is like a diamond shine and this feature makes Swarovski crystals so popular. What makes Swarovski crystals different from other rhinestones? They always have a round shape and a patented number of faucets. The rhinestones are made only from high-quality rock crystal, and a reflective film is applied to the lower surface. 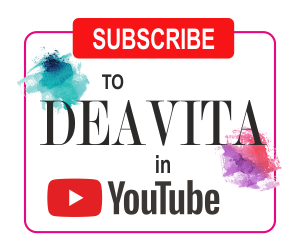 Draw a sketch of the rhinestone layout to see how the design will look. 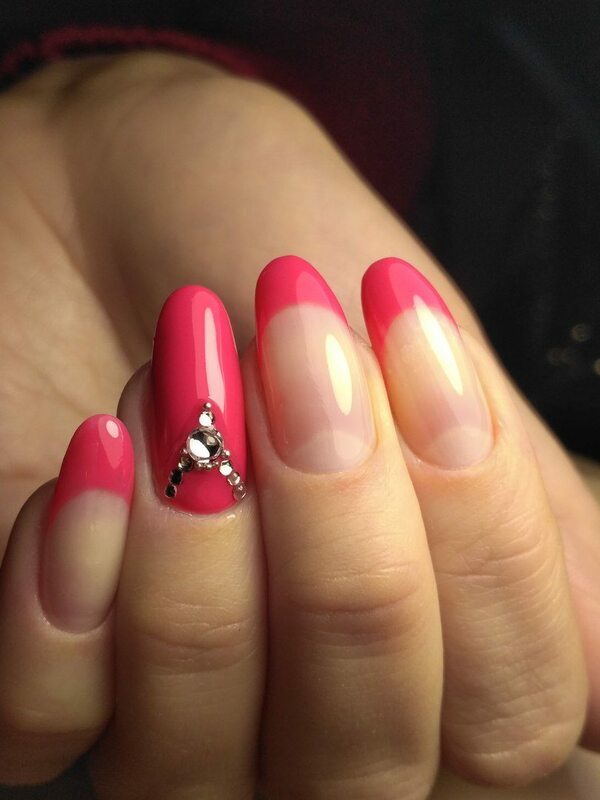 You can change and improve the sketch until you like the result and only then proceed to apply the stones on the nails. The choice of color of rhinestones depends on the color of the base on which they will be attached. There are two possible options: combination or sharp contrast. With a neutral base, the color of the rhinestones can echo the color of any of your accessories. However, when using rhinestones in different colors, one should keep the rule of moderation. It is enough to use two different colors. It is acceptable to use more shades, but then they should be in the same color scheme. When you are in doubt, it is best to use rhinestones in neutral colors like champagne or transparent. 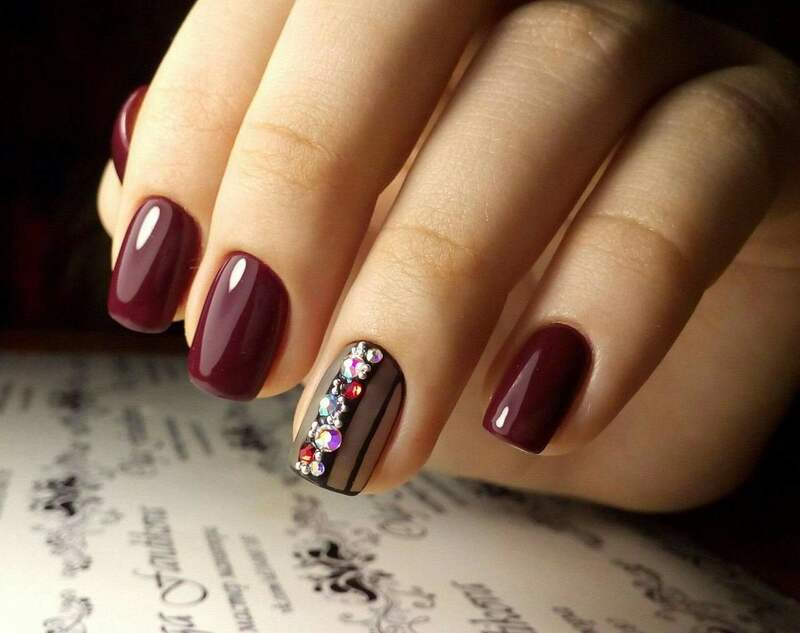 Large rhinestones make the decoration of the manicure look bigger and visually reduce the size of the nail plate. 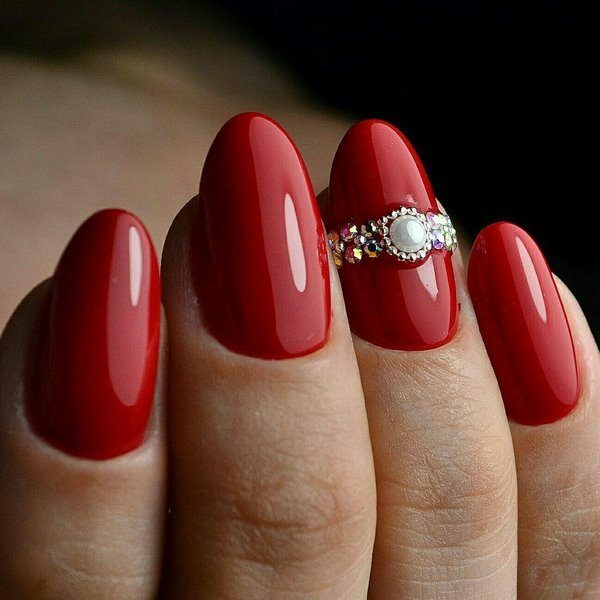 They should be used only on long nails and it is better if you used just one stone. 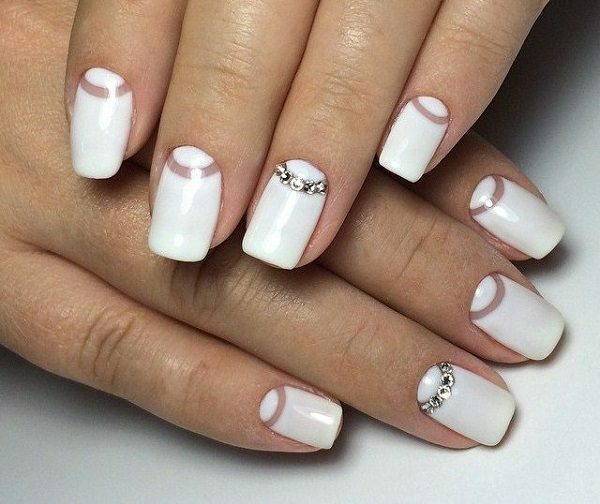 Piling multiple small stones at the base of the nail plate will make the nails look shorter and such designs are not suitable for broad, short nails. 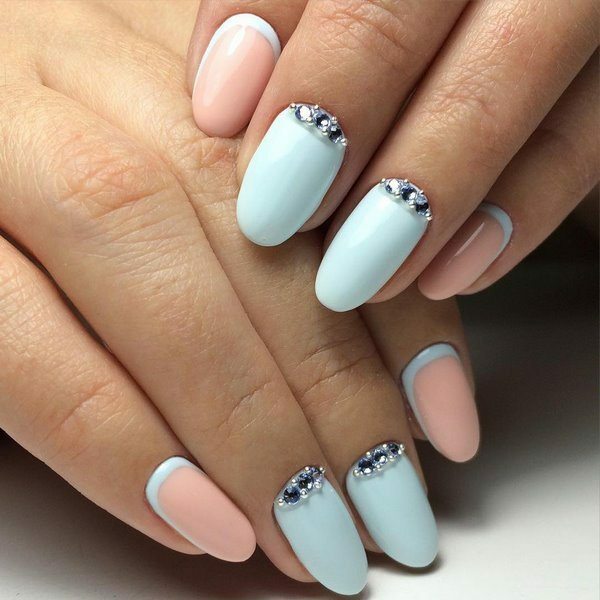 Always remember the main rule – nail designs with rhinestones must reflect the refined taste of the woman so make sure you are not mixing them with other decorative elements or overdoing the design. 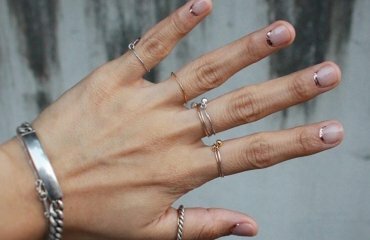 Minimalist nail art ideas – is less more in nail design?